Of all the many thousands of stained glass windows installed over the years by Scottish Stained Glass sidelights at the front entryway have always been the most popular application for our clients. The reason is fairly obvious. When a visitor walks up to your front door they ring the doorbell and then immediately look through the side window to see if you are home. This gets annoying for the occupant of the home and even when it`s your friends and family visiting who only have good intentions it makes you want to cover up the glass. But the next question is what to use to cover the glass. Blinds will block the light and make your entryway look dark. Curtains and sheers are impractical. The answer is of course to use some beautiful leaded or stained glass. The light will come in and the unwanted viewing will end. Your front door sidelights and entryway are also the first impression a visitor sees when they enter your home. Leaded glass makes a great first impression and if you ever come to sell your home the leaded glass will attract buyers and set your home apart from the competition. 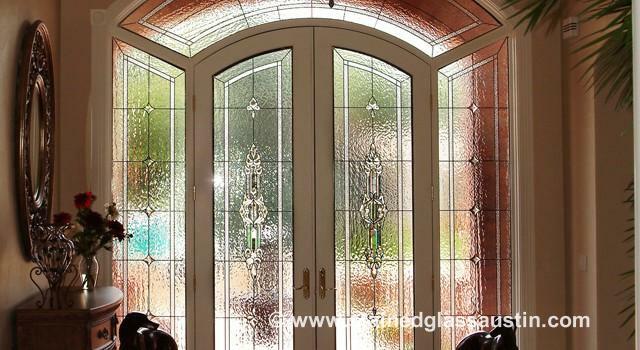 As visitors leave your home the final impression will be your elegant entryway with it`s beautiful sidelight stained glass. We are often asked whether our clients should use color in these windows or simply use clear textured glass with perhaps some clear cut glass beveled pieces. The answer is of course up to the individual but in 80% of entryways our clients use little or no color, preferring instead the timeless and elegant look of textured and beveled glass. This allows the homeowner to paint the walls and redecorate many times during their stay in the home without having to worry about whether the stained glass will still fit in with the new decorating color scheme. Safety can also be a concern around sidelight windows, especially the threat of break ins. Stained glass sidelights can prevent potential intruders from seeing into your home and also makes the glass at the sides of your door more difficult to break through. It`s nice to know that when you add stained glass sidelights to your home in San Antonio that not only are you adding beauty, equity and functionality to this are of your home but you are keeping your family safer as well. Call us now to schedule your free consultation and see for yourself the difference stained glass sidelights can make to your home.